On April 27, the day before International Workers' Memorial Day, the IUF-affiliated Catering and Hotel Industries Employees' General Union (CHIEGU) and HKCTU held an action in front of the Hilton Conrad Hong Kong Hotel to commemorate a housekeeping worker who died at work in October 2017 as a result of excessive working hours. An investigation by the union revealed that the hotel housekeeper had worked continuously for 16 days without any leave or rest breaks before he died while working. 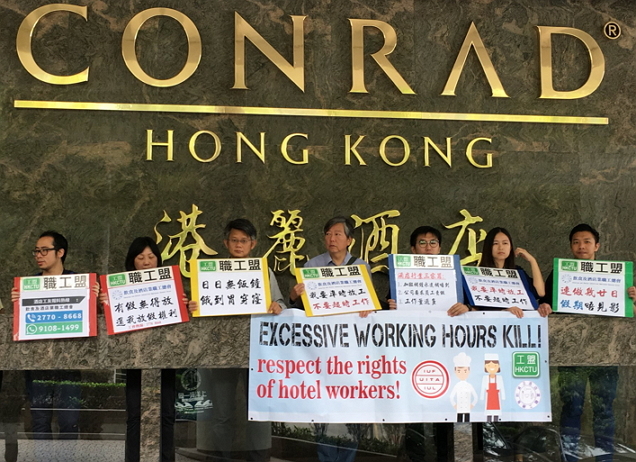 Surveys by the union showed that excessive working hours are common in all major hotels in Hong Kong, including Accor’s Novotel hotels, Shangri-La, and the Hilton Conrad Hong Kong. In addition to regular, involuntary overtime, workers are required to "sell" their paid holidays back to the employer for additional income, resulting in continuous work without rest days. CHIEGU called on the major international hotels to address the serious health risks posed by excessive working hours by ensuring decent wages for 8 hours work and increasing staffing levels through hiring with better pay.